If you enjoy sleeping on your side, you know that quality of your side sleeper pillow can make or break your sleep experience. What material makes a good side sleeper pillow? Who designs these products, and does that affect my spinal health? Are all side sleepers suitable for my body type? In the following reviews, we’ve done our best to answer these questions and more. The best side sleeper pillows need to be made out of the best materials, right? The Sleep Yoga® Side Sleeper Arm Rest Posture Pillow is made from a blend of top-notch cotton and lyocell (45% and 55% respectively), ensuring that you’ll have a comfortable skin-to-skin experience with your new side sleeper pillow. While some other pillows on the market are designed without any forethought put into how they will effect your posture, this Sleep Yoga® product is specifically engineered to encourage the best sleeping position possible. With special care taken to ensure proper spinal alignment, this product will do wonders for your back in the long run. Not many pillows on the market can boast this claim. Strategically engineered with angles and contours meant to fit with your body, the Sleep Yoga® Side Sleeper will ensure that your spine gets professional treatment. With this product, it will really be like you’re doing yoga in your sleep. There’s a lot to like about the Sleep Yoga® Side Sleeper. For one, it offers some of the best, most breathable material on the market. It’s also fantastic for your posture, as it was professionally engineered by chiropractors for the purpose of better back and spinal support. With this product, your sleep posture is in good hands. Honestly, there’s not a ton about this product to dislike. Because it’s so geared towards the back and spinal support, you may need to take a short amount of time to break it in, and even then it may not seem incredibly comfortable at first. But if you’re patient with it, this is one of the best side sleeper pillows on the market. 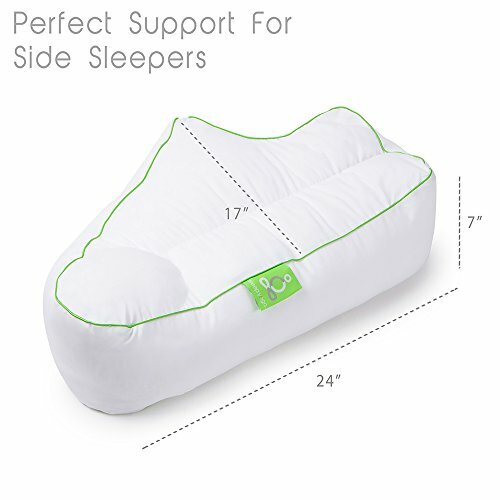 A great side sleeper pillow needs to be well designed, and the Iso-Cool Memory Foam Pillow has one of the most unique side sleeper designs on the market. With its microscopic PMC beads, this product ensures that your body heat wont just pool up wherever your heat makes contact. Rather, its design absorbs that head, making for a cool and comfortable experience. With its extra strong gusseted design, the Sleep Better Iso-Cool Memory Foam Side Sleeper Pillow maximizes your comfort level, while still able to endure the type of wear-and-tear that’s common to side sleepers. Plus, with its Visco-elastic memory foam filling, this Sleep Better item will do just that; make you sleep better. Part of what makes a good side sleeper is the range of people it can benefit. The Sleep Better Iso-Cool Memory Foam Side Sleeper has broadly encompassing dimensions (16 x 22 x 2 inches), so it will likely suit your body type. The Sleep Better Iso-Cool Memory Foam Side Sleeper certainly has great materials. It’s made for sleeping on your side, and promotes proper spinal health. With a design that provides back support and materials that won’t cause you to overheat, this product is a soldier choice for those who sleep on their side. While there’s a lot to like about this Sleep Better product, it simply doesn’t have the same clinical design as the Sleep Yoga product on our list. Undoubtedly, this Sleep Better pillow is a comfortable choice that’s good for your back, but it can’t boast the same medically sound spinal support as the Sleep Yoga pillow. Originality is one way to tell you’re getting a great product, and with its unique micro-air bead system, the Sobakawa Cloud Pillow is one of side sleeper pillows available today. This micro-air bead system provides firm head and neck support and truly makes you feel like you’re resting on a cloud. A great side sleeper pillow ought to be constructed with great materials to ensure that your temples are breathing and you’re not covered in sweat. With a blend of polyester and spandex (87% and 13% respectively), the Sobakawa Cloud Pillow ensures that your head will breathe. Great design is a key component to a great side sleeper pillow. The Sobakawa Cloud Pillow boasts a unique crescent shape that contours to your neck and shoulders. Anatomically, it provides comfort and firm neck and head support, while aesthetically, it’s a stylish addition to your bedspread. The micro-air bead system is the most impressive aspect of the Sobakawa Cloud Pillow system, as it provides cloud-like support for your neck and shoulders. However, this Sobakawa product also boasts impressive design, and could potentially be helpful to those who seek a consistent sleep posture. While the micro-air bead system is certainly quite comfortable and seem to provide as much support as any great pillow would, there’s no research that shows that this uniquely engineered system will help your posture in the long run. While the Sobakawa Cloud Pillow and the Sleep Better Iso-Cool Memory Foam Side Sleeper Pillow are great products in their own right, we had to give it to the Sleep Yoga® Side Sleeper Arm Rest Posture Pillow for the best side sleeper pillow on the market. Not only does it breathe, not only does it offer exceptional materials, not only is it designed to improve your spinal alignment, but it is a chiropractor-engineered system that is clinically proven to improve back health. Whether you suffer from back pain, you’re concerned with your spinal health, or you simply enjoy a comfortable pillow, this Sleep Yoga product is a great choice for you.